Jeremiah 29:11(AMP); For I know the thoughts and plans that I have for you, says the Lord, thoughts and plans for welfare and peace and not for evil, to give you hope in your final outcome. Our theme scripture is one that has been quoted over the years in many Christian circles but today, I want to cast a different light in your spirit. God knows the plans that He has for you, plans for welfare and peace, to give you hope and an expected end. However, this scripture is often embraced with a passiveness which is contrary to the will of God. To some Christians it is an excuse not to seek the face of God about the details of their lives. After all, he knows the plans He has for us. The scripture has been used as an excuse for indifference to the mind of God pertaining one’s life. Child of God, there is more to it than that. This knowledge is not supposed to be far from you. He knows the plans He has for you, but do you know these plans? He has a vision for your life but do you know this vision? 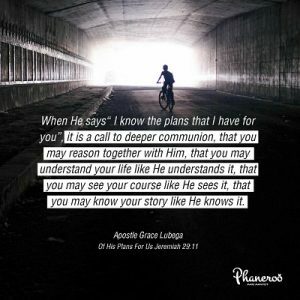 When He says “I know the plans that I have for you”, it is a call to deeper communion, that you may reason together with Him, that you may understand your life like He understands it, that you may see your course like He sees it, that you may know your story like He knows it. Beloved saint, God does not expect you to stay in the dark about the plans that He has for you. Make the choice to understand the course that He has set for you. Seek Him for His vision for your life. Hallelujah! PRAYER: My God, I thank You for this Word for today. I know the plans that You have for me. I see the course that You have set before me and have the vision for my life. I embrace this truth and see with deeper clarity the blue print that You have drawn for my destiny. I will never depart from this course because You have made my paths straight. In Jesus’ name. Amen.